About Us - Naumes, Inc.
Our family has grown fruit for 100 years. Today, we are one of the largest pear growers in the United States, and we are committed more than ever to meeting the needs of our customers. Three generations stand behind the Naumes label you see today. Naumes Inc. was established in 1946 by Joe Naumes and Steve Nye after both men returned from active duty in World War II. Joe, having served in the Pacific with the Navy and Steve in Europe with the Army. Originally established as a packing company called Nye and Naumes Co. Inc., it eventually acquired orchards and soon packed only its own product. In the early 60's the Naumes Family bought out the Nyes. In the early 70's the next generation returned from college and graduate schools and began work. By the mid 70's the first California Orchard was acquired from the former C.E. Sullivan ranch in Yuba City, California. In 1978, the last of the Di Giorgio Company's farming operations were acquired across the river in Marysville bringing the California operations to 2,500 acres. 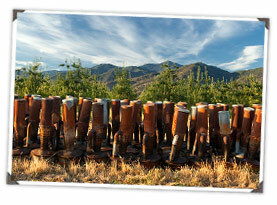 In the early 80's the Chelan Apple Co. and the J.K. McArthur & Sons Co. were aquired in North Central Washington. The company was now farming nearly 7,500 acres. They said he was crazy, that it wouldn't work. No way could you build a packinghouse at ground level -- how would you move fruit off the trucks into the shed? Joe Naumes had the answer -- a forklift. He built the packinghouse and successfully introduced the first forklift to the Rogue Valley's Pear Industry.